Jacopo Tintoretto’s next major project, in the late 1570s, was to provide paintings for the ceiling of the Sala superiore in the Scuola Grande di San Rocco. But before that, he and his workshop painted three works for the church of Santa Margherita, which has since been deconsecrated, and its paintings transferred to that of Santo Stefano. 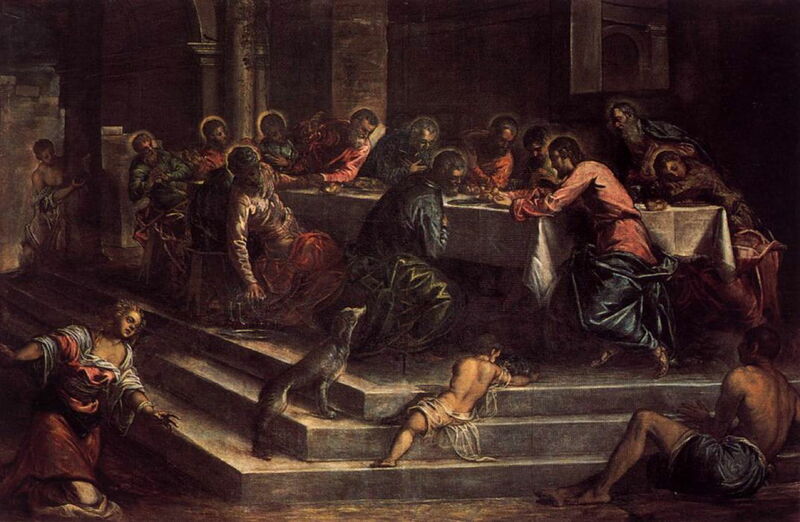 Jacopo Tintoretto (c 1518-1594), The Last Supper (E&I 169) (1576), oil on canvas, 349 x 530 cm, Santo Stefano, Venice, Italy. Wikimedia Commons. In 1576, Tintoretto designed another Last Supper (E&I 169), most probably painted by his studio, which continues his series of innovative and informal treatments of this popular theme. It is another oblique view, which appears to seat Jesus at the end nearest the viewer, rather than in the middle of the more distant long side. He uses a similar cast to his previous versions, complete with an infant crawling up the steps, and a dog. Tintoretto was now in good standing with the Scuola Grande di San Rocco. He had been admitted to the confraternity in 1565, and had served as one of its deacons, and as a syndic, and his paintings in its albergo were much admired. He still had his opponents, but when in July 1575 he offered to provide a very large painting to go in the middle of the ceiling of the Sala superiore, the Scuola gratefully accepted. Jacopo Tintoretto (c 1518-1594), The Brazen Serpent (E&I 173) (1576), oil on canvas, 840 x 520 cm, Sala superiore, Scuola Grande di San Rocco, Venice, Italy. Wikimedia Commons. This remarkable centrepiece is known as The Brazen Serpent (E&I 173), and was completed in 1576 after about a year of planning and preparation. Being slightly more that 8 x 5 metres (26 x 16 feet) and mounted in the middle of the ceiling, it is very difficult to get a good and faithful image of it. The Brazen Serpent is not only large in size, but is epic in its imagery. Based loosely on the Old Testament book of Numbers, chapter 21, 5-9, it refers to a period in which God sent ‘fiery serpents’ among the people, because they had spoken against both God and Moses. The cascade of figures in the foreground, filling much of the lower half of the canvas, are the victims of the many snakes seen among their bodies. Above and beyond those writhing bodies, on the brightly-lit plateau, a serpent is ‘crucified’, and brings healing to those who remain enlightened. Above them is the figure of God, bearded and bald, flying with his swarm of angels. Parallels have been drawn with the situation in Venice at the time: there had been another severe outbreak of plague in 1575-76, which on 27 August 1576 had claimed the life of the great Titian. Provision of the remaining paintings to complete the ceiling took Tintoretto and his workshop remarkably little time. There are a dozen substantial works in addition to their centrepiece, and another eight smaller pieces, the majority of which were largely executed by Jacopo’s workshop between 1577-78. The whole cycle can be seen as detailing the preparatory steps which led up to Christ’s Passion, as shown in the albergo. Those paintings which are believed to have been designed and executed largely by Jacopo himself include the following. 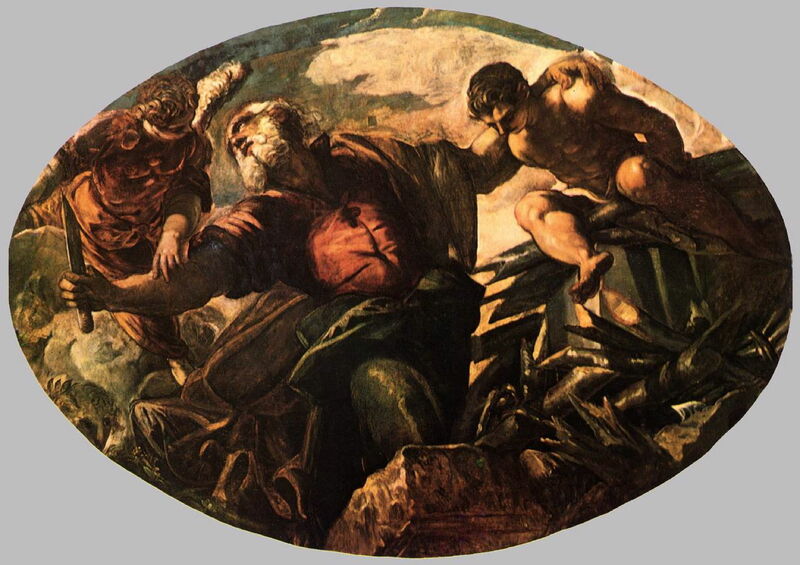 Jacopo Tintoretto (c 1518-1594), Moses Striking the Rock (E&I 174) (1577), oil on canvas, 550 x 520 cm, Sala superiore, Scuola Grande di San Rocco, Venice, Italy. Wikimedia Commons. The first two show episodes in which God, through Moses, provided for the Israelites during their protracted exodus. Moses Striking the Rock (E&I 174) (1577) shows water gushing from what had been dry rock after Moses had struck it with his staff, so relieving the people of their thirst. 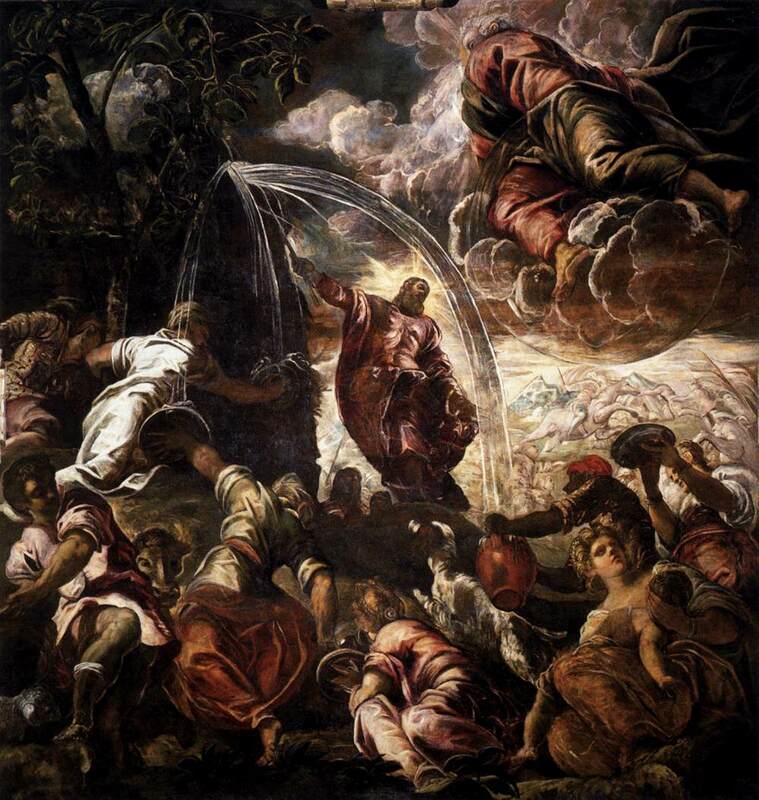 Tintoretto (1518–1594), Gathering of the Manna (E&I 175) (1577), oil on canvas, 550 x 520 cm, Sala superiore, Scuola Grande di San Rocco, Venice. Wikimedia Commons. The Gathering of the Manna (E&I 175) (1577) is even more spectacular, and probably the first depiction of this provision of food which is faithful to the Biblical account that the manna fell at night. It also shows very clearly that it came not just ‘from above’, but from God himself. Set around those three major, rectangular canvases are ten smaller oval or extended oval tondi, showing key events from the Old Testament. Jacopo Tintoretto (c 1518-1594), Jonah and the Whale (E&I 179) (1577-78), oil on canvas, 265 x 370 cm, Sala superiore, Scuola Grande di San Rocco, Venice, Italy. Wikimedia Commons. Jonah and the Whale (E&I 179) (1577-78) is one of the smaller tondi, and shows the prophet Jonah stepping out of the mouth of a huge whale, seen to the right. Next are two paintings of visions recorded in the Old Testament, on extended ovals. 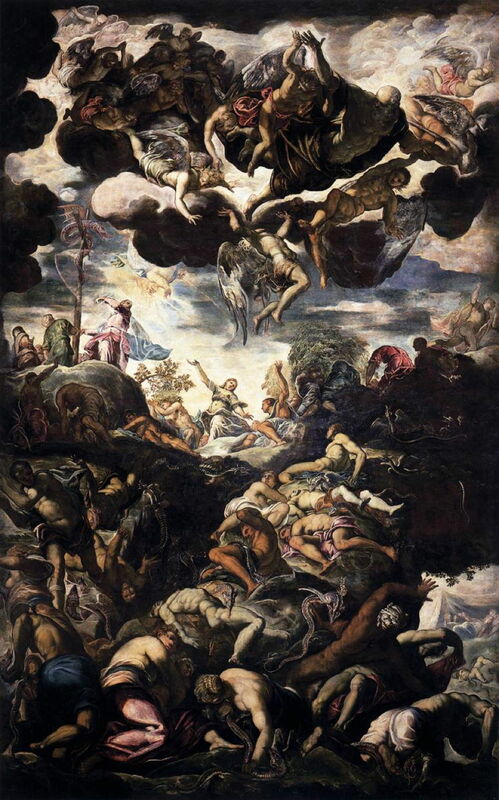 Jacopo Tintoretto (c 1518-1594), The Vision of Ezekiel (E&I 180) (1577-78), oil on canvas, 660 x 265 cm, Sala superiore, Scuola Grande di San Rocco, Venice, Italy. Wikimedia Commons. The Vision of Ezekiel (E&I 180) (1577-78) refers to that recorded in the book of Ezekiel chapter 37, popularly known as the ‘Valley of Dry Bones’. In this, the prophet saw himself standing in a valley full of dry human bones. As he carries a prophecy, on command, the bones are progressively covered with tendons, tissues, and skin. God reveals that these are the people of Israel in exile, and Ezekiel is commanded to carry another prophecy to bring those human figures back to life, and to the land of Israel. Jacopo Tintoretto (c 1518-1594), Jacob’s Ladder (E&I 181) (1577-78), oil on canvas, 660 x 265 cm, Sala superiore, Scuola Grande di San Rocco, Venice, Italy. Wikimedia Commons. Jacob’s Ladder (E&I 181) (1577-78) shows the dream of Jacob, when he was fleeing from his brother Esau. In this, a ladder connected that place with heaven, and on that there was a constant stream of angels descending and ascending. God stood beside Jacob and told him of the great future for his descendants, and promised never to leave him. 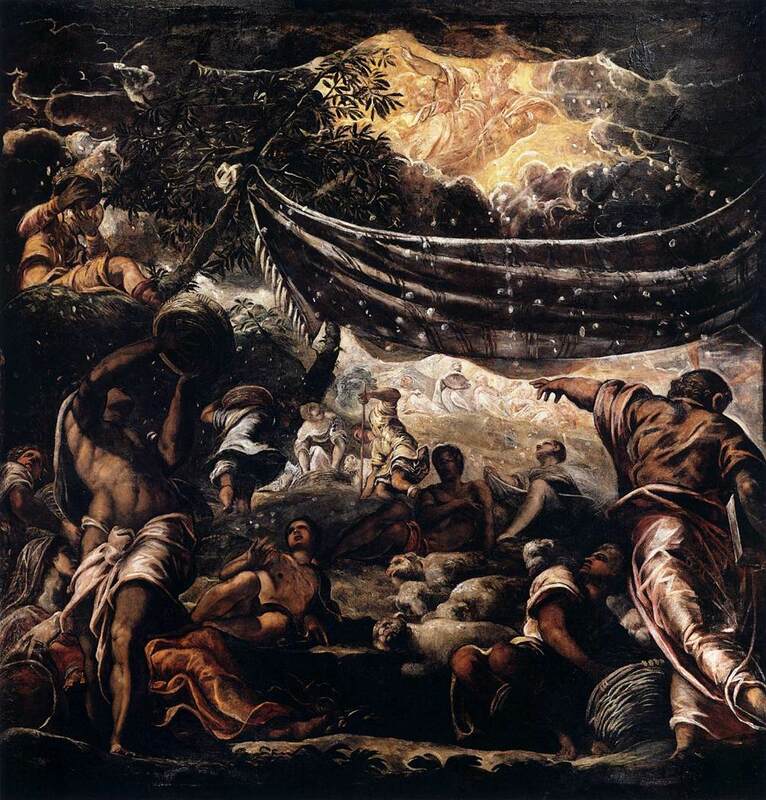 Jacopo Tintoretto (c 1518-1594), The Sacrifice of Isaac (E&I 182) (1577-78), oil on canvas, 265 x 370 cm, Sala superiore, Scuola Grande di San Rocco, Venice, Italy. Wikimedia Commons. 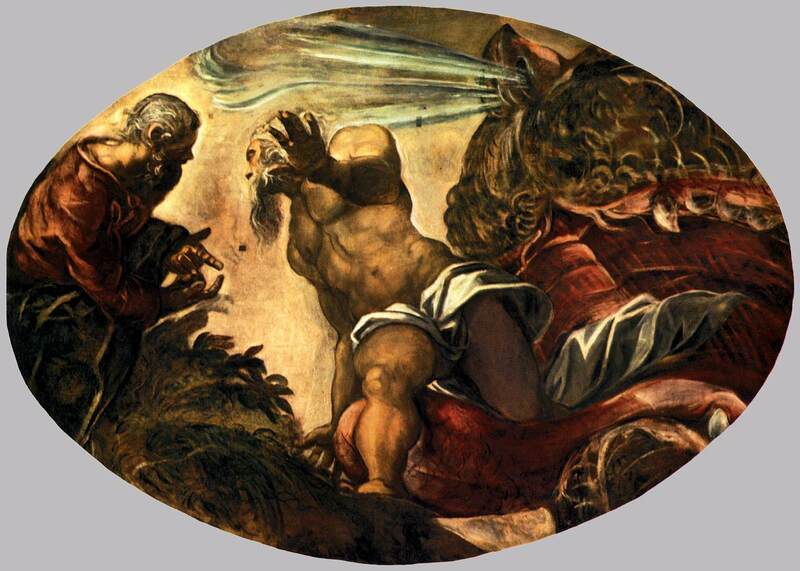 The final painting made by Jacopo Tintoretto is The Sacrifice of Isaac (E&I 182) (1577-78), showing Abraham ready to sacrifice his son Isaac on Moriah, at the command of God. Just as the knife is drawn and the father is about to kill Isaac with it, an angel, as messenger from God, interrupts and tells Abraham to sacrifice a ram instead. Elijah Fed by the Angel. Once these were completed, Tintoretto continued to move backwards in time, when he returned to painting classical Greek myths, mostly for the Palazzo Ducale, leading to one of his greatest works of all. I will show those in the next article.